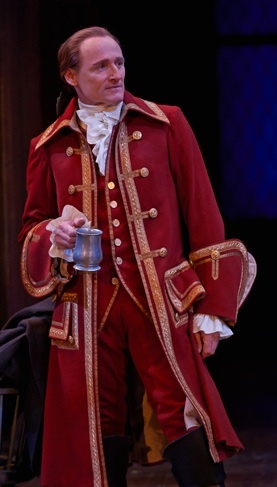 The Stratford Festival ends its 2014 season on a high note with its production of the 18th-century comedy The Beaux’ Stratagem (1707) by George Farquhar. Restoration and 18th-century comedy has not exactly been a regular feature at Stratford. The last two English plays the Festival staged from this period were Sheridan’s The School for Scandal (1777) in 1999 and Wycherley’s The Country Wife (1675) in 1995. The Beaux’ Stratagem was last seen at Stratford in 1985. The Festival’s new vivacious production reminds us how delightful the sophisticated comedy of this period can be. The plot concerns two gentlemen, Thomas Aimwell (Mike Shara) and Francis Archer (Colm Feore), who have fallen on hard times. To restore their fortunes they have had the idea of travelling from town to town seducing wealthy women and stealing their money. In each town the two trade roles – one playing an aristocrat, the other his footman. In Staffordshire town of Lichfield, where the action is set, Aimwell has taken on the title of viscount, borrowed from his elder brother, and Archer is his servant. The two are staying at an inn run by Boniface (Robert King) and his lovely daughter Cherry (Sara Farb) that doubles as a hideout for a gang of thieves headed by Captain Gibbet (Victor Ertmanis). Boniface naturally assumes that Aimwell and Archer are a pair of highwaymen too. already started an affair with the French Count Bellair (Evan Buliung). Both beaux suffer difficulties since Aimwell, contrary to plan, falls in love with Dorinda, and Archer, in his disguise as a footman, has to convince Mrs. Sullen that he is worthy to woo her. A further complication is that Sullen, his wife and his sister all live in the same country house owned by Sullen’s mother Lady Bountiful (Martha Henry), a devotée of naturopathy. The play in its beautifully constructed dialogue and in its themes of marriage, money and love looks forward to the novels of Jane Austen one hundred years later. Mrs. Sullen’s meditations on being trapped in a loveless marriage seem very modern. Traditional comedy ends in a spate of marriages symbolizing the creation of a new society. Farquhar’s ending, however, daringly contravenes tradition by simultaneously celebrating a marriage and a divorce. The difficulties in directing plays of this period are in establishing the right style. Overall, the style is sophisticated, even when characters make bawdy allusions. The world on stage must seem bound by a strict etiquette with a clear distinction between the upper and lower classes, since much of the humour derives from transgressing those boundaries. With the help of his nearly ideal cast, director Antoni Cimolino attains this style effortlessly. While he allows the lower class characters to be a bit too rambunctious he, thankfully, stays very close to the text, avoids gimmicks and seldom feels the need to add business to make the play “funnier”. One notable exception is when he has Lady Bountiful, hearing there are burglars in her house, rush in clad in armour and wielding a broadsword, but the effect is in character with the dotty old lady and so funny it is easily pardonable. Most of the cast speak Farquhar’s fine prose with great clarity and find more humour and nuance in his lines than I’ve noted in other productions. Colm Feore and Lucy Peacock especially shine in blithely conveying the text’s surface formality and often saucy subtext. Of the two beaux, Feore with his natural gravitas and Shara with his gift for goofiness, initially seem ill-assorted as master and servant. But as the play goes on this ill-assortment becomes part of the joke and justifies itself. Shara is particularly good at physical comedy which reaches a highpoint in the scene where is carried into Lady Bountiful’s house and is simultaneously ministered to emotionally by Dorinda and physically by Lady B. herself. who does not suit her role. Dorinda is supposed to be Sullen’s sister and Mrs. Sullen’s sister-in-law, but Wentworth and Peacock are old enough to be Jillard’s parents. The role requires someone more equal in age and ability to Peacock’s Mrs. Sullen. Jillard can do nothing about her age, but her line readings simply don’t match those of Peacock in clarity or nuance. Wentworth’s Squire Sullen more than lives up to his name by being actively surly rather than merely moody. Martha Henry’s Lady Bountiful is an amusing creation. She may be the wise woman of the town with her knowledge of potions and herbs, but Henry suggests she’s also more than slightly off her rocker. Farquhar surrounds his main portraits with a panoply comic character sketches. Gordon S. Miller is very funny as the goodnatured but addlepated servant Scrub. Robert King’s drawl well suits the unscrupulous innkeeper Boniface. Sara Farb is his sprightly but honest daughter Cherry. Victor Ertmanis looks and sounds aptly debauched as the highwayman Gibbet. Evan Buliung fills out Farquhar’s delightful caricature of the aristocratic French lover Bellair. And Michael Spencer-Davis is hilarious as the Irishman Foigard, who keeps insisting he is French despite his telltale brogue. Patrick Clark suggests the two main locations, the inn and Lady Bountiful’s manor, with just enough furniture that can be swept away and reset for the frequent scene changes. Clark’s gowns for Mrs. Sullen and Dorinda and his “suit in ditto” for Aimwell are in gorgeous complementary pastels, while coat and breeches for Bellair are wonderfully gaudy and his greatcoat and wig for Gibbet suitably tattered and soiled. The present Stratford company seems so attuned to this style of comedy and the current production is so enjoyable that we can only hope the Festival will in future delve more often into the riches of this period. 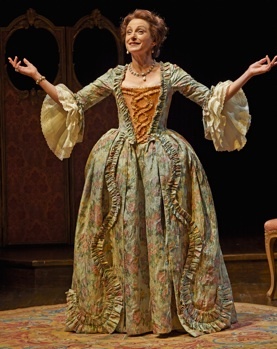 Photos: (from top) Members of the company in The Beaux’ Stratagem; Colm Feore as Archer; Lucy Peacock as Mrs. Sullen. ©2014 Michael Cooper.